I decided to use this together, as in I use the Foam Cleanser first, and the Daily Scrub second. I found that the foam cleanser didn't do a lot for me at first - until I realised I was actually using it wrong! (Note to self - always read instructions!) Make sure you shake before you use to get a nice foamy bit of cleanser! I usually used two - three pumps, which I felt did a fairly good job. On days that my skin felt particularly grimy, I did feel I needed to double cleanse with another cleanser, but for normal day to day use, the Foam Cleanser definitely did the job. I also had problems at the very beginning with the scrub! I found it to be too "wet" and not really scrub like at all. Then I decided I was using far too much, and when I used only a pea size, it worked a lot better! I'm used to using a lot of product with scrubs, because I like scrubs, so it was a change to just use the tiniest amount! In saying that, I loved the scrub once I got used to not overloading my skin with it! I felt it really helped keep my skin clear! 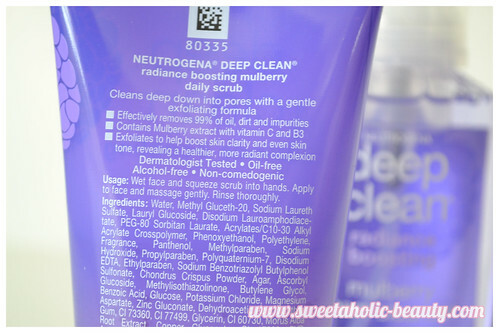 The Neutrogena Deep Clean Radiance Boosting Mulberry Daily Scrub is also oil free and alcohol free so again, perfect for sensitive skin. This would definitely be my favourite out of the two. It was gritty, but not too gritty that it would aggravate sensitive skin or flare ups. My skin felt really soft and exfoliated after using it, so I was pretty happy with the outcome. 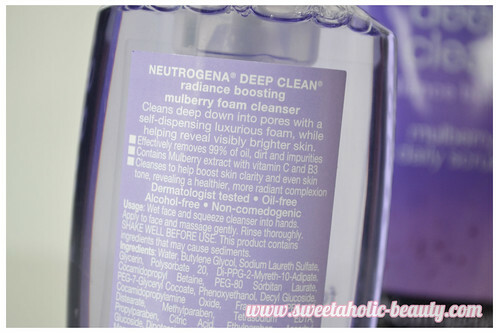 Overall, I'm a fan of the new Neutrogena Deep Clean products. During winter, they were the perfect choice for removing dirt and grime from my skin without drying it out or aggravating it! I also really enjoyed the scent of both products, so if you're a fan of mulberry, I would definitely recommend! At only $13.99 each, you can't really go wrong! 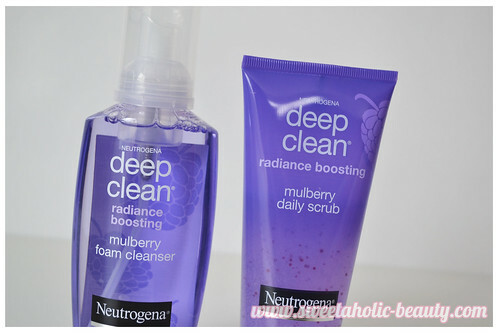 Have you tried the Neutrogena Deep Clean Radiance Boosting Mulberry Foam Cleanser & Daily Scrub yet? If so, what did you think? Do you like the scent of mulberries? I love that it has a mulberry scent so unique! I can only imagine how amazing these products would smell! I probably would've used the foaming cleanser wrong too as I'd just expect it to dispense in foam form! These sound really nice and gentle for the skin. Very convincing post haha. I have to check this out soon! Not sure I've ever smelled anything mulberry scented, but your post and the packaging has me wanting to try them out. Great post. I was sent this too and I love the scent! The foam is a little too dry for me; I have dry skin though. I sent one to Abigail for her to try out (since I think she has oily-combination skin and it might work better for her). Nonetheless, I am a fan of Neutrogena products! Hi I was just wondering whether the products worked on acne prone (teenager) skin and what routine did you use with both of the products? The cleanser every day and the scrub once a week? I love the scent but it broke me out! Neutrogena products never seem to work for me.